Think "Big Brother" meets "The Apprentice" meets "Julie Newmar." Restaurant/bar The Palace is looking for contestants to participate "Palace Boys," an online reality show that, according to the show's website, "isn’t your mother’s reality show, unless your mother likes to dress in drag and sing her heart out on stage." 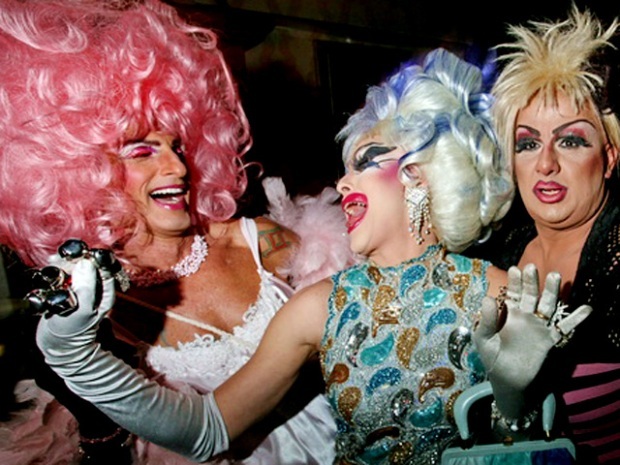 The Ocean Drive spot, known for its popular Sunday brunch, recently won the right to keep their boistrous drag shows going after a neighboring hotel complained about the noise. Now, they just might have to deal with throngs (okay, someone's "Spartacus"-loving brother) of reality celeb stalkers. Based on an application and video, the public and judges will vote on the semi-finalists, who will become -- to steal a certain MTV show's tagline -- ten strangers, picked to live in a condo, and have their lives taped. The show's contestants will also have to participate in personal blogs, vid updates, live chats and challenges, and the winner -- based on votes -- will receive a "$3,000 prize," a year-long stint at the Palace, an electric bike, a photo shoot and a magazine cover. We're not sure if "Palace Boys" is going to be the next "Real World," or even the next "Bad Girls Club," but if there's at least one make-out hot tub scene, it'll be infinitely better than "Miami Social."